I prefer to buy products and services I perceive to be of high value that are provided by people who live their values. I am not alone. Values and value based businesses are on the rise. 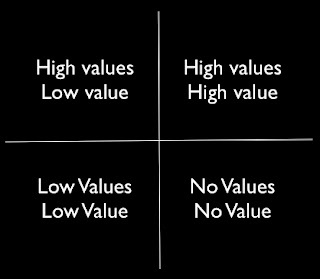 Where does your business sit in the following quadrant? If the majority of your customers/clients do not see you in the top right hand corner your business is in deep trouble. "I am the world's worst salesman, therefore I must make it easy for customers to buy." Make it easy for your customers/clients to buy from you by delivering value to them that they demand, desire and feel they deserve, and do so in ways that demonstrate you mean what you say. Will banks ever regain their reputation? I doubt it. They are seen by most people as a necessary evil. Credit unions and community based banks are taking on traditional banks. Companies whose brands are what the worldwide CEO of Saatchi and Saatchi Kevin Roberts calls lovemarks, like Virgin, are entering the financial world in a big way. And good for them. Most of us are sick and tired of being worked over by bullies in banks. Do your customers/clients love what you provide and how and why you provide it? Be values and value driven and they will. My mother-in-law recently started buying her everyday produce from Aussie Farmers who are currently one of the fastest growing organisations in Australia, in part I think because a lot of us don’t enjoy shopping in supermarkets, and more, we don’t like what supermarket owners are doing to the people who supply the produce. How do you treat people who supply you? How do all of the stakeholders of your business regard you, not just your customers/clients? Will politicians ever have any credibility? As a collective I doubt it. What I am seeing more than ever in my lifetime is that people are working around politics to get things of real value done. I can’t see this changing any time soon. Are the Values on your wall, lived in the hall? Watch my 5 minute story below to find out. I work well with people who live the following values in their own way. Personal Significance: You accept you are a one-of-a-kind and work daily to bring everything remarkable that you are to everything you do. 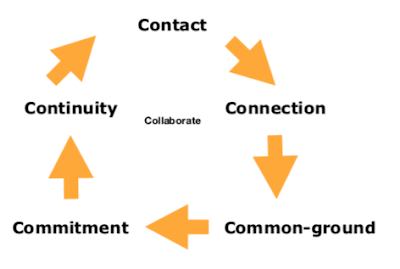 Collaboration: You know that nothing really great is achieved alone and work with others to replace the status quo when same no longer serves. Design: You are always seeking to design and implement pioneering and truly innovative ways to create and deliver value. Sustainability: You demonstrate by your actions that you are committed to leaving the world a better place than you found it. In an excellent book Start With Why, author Simon Sinek says people don’t buy what we do, they buy why we do it. You can watch a brilliant TED talk by Simon by scrolling down to Sparkenation 38 here. What is your deep reason - your why - for being in business? Your values and your reason must be deeply connected if you are to be authentic in the delivery of value to your customers/clients. Do your customers/clients get your why? There are obviously costs to producing our products/services. When we add profit margin to these costs we have in crude terms the price of what we are offering. Price however is not value. More and more people are prepared to pay for value as perceived by them. The price my mother-in-law pays Aussie Farmers for example is competitive with supermarket prices yet the value of home delivery, helping local farmers and getting fresh produce in season, mean much more to her than price. What is the value of your product/service perceived to be by your buyers? If it is price (cost + profit) then all you have is a commodity and someone will soon offer a better price. If however your buyers perceive value greater than just price and the exchange with you is seen as fair, reasonable, and ethical, you are offering value as perceived by your buyers. The results/outcomes and feelings of using your products/services as perceived by your buyers are key to value. As a general rule the greater the perceived result/outcome/feeling, the higher the perceived value. Is it crystal clear to your customers/clients what wants or needs you fill for them, or what problem/s you solve for them? I drive past several service stations near my home to put petrol in my car. The reason is that I get treated like a human being there. Value trumps price for me in pretty much everything I buy. Would I drive past you? Would I stop at your place and receive value according to me? Would I come back again and again because your values mirror mine? Why are people buying from you? and why aren’t people you want buying from you? Your carefully considered answers to these questions will help you to determine changes you need to make in your business. Normal doesn’t cut in anymore. How will you change what’s normal? Kevin Roberts says lovemarks transcend brands. 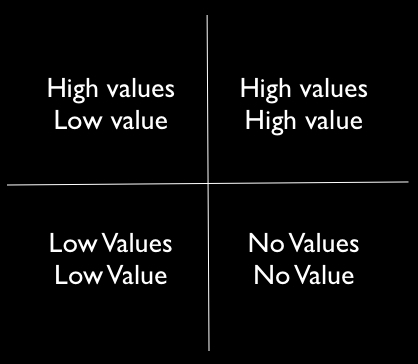 Who is in love with what your business stands for (your values) and the value you deliver?